This is a PREORDER - Will not ship until around August 1st. This is by far my favorite record I've ever made. It is the product of many hours of experimentation, measurements, blind luck, and dumb jokes being made real by sheer force of will. This is, however, no longer a joke. This is a real 5 holed record that plays. 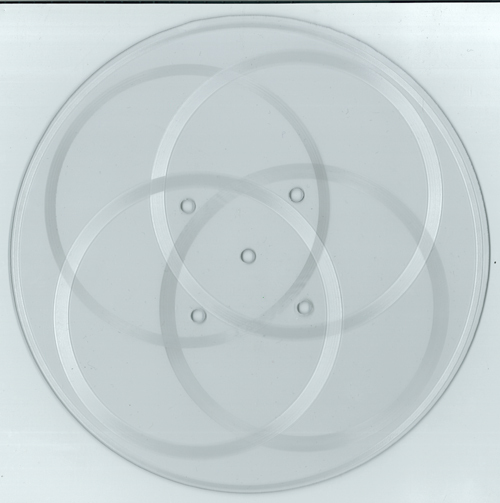 This Six "Sided" 10" record is composed of six distinct groove rings. Each side has a Venn Diagram of Groove in the middle and a short ring on the outside of the 10". As the grooves of the Venn Diagram cross, they make a little chirping sound. They will usually not skip, but you may need to adjust your tonearm weight and anti-skating a little. Dimitri specifically composed a 16 minute sound collage with this chirp in mind. Each Great Six Sider 10" is somewhat unique, in that the rings were cut using an unspecific portion of Dimtri's composition and were then locked off into locked grooves when the ring ends. No rings or locked grooves are the same. Please consider these more of a work of art in the form of a record than just another record in your collection. We know they are expensive and that art pieces like this are not of interest or in the budget of some people. LATHE CUTS: Please understand that lathe cuts are NOT pressed records... they are made one at a time, in real time, using a DIY and experimental process. The volume and fidelity is somewhat lower than a pressed record. However, we test each one before it leaves, so they should all be totally listenable and sound pretty good considering the details of their birth. PRICING: Because of the high material cost and labor intensive nature of the discs themselves, we have to price these higher just in order to cover our costs and overhead. Not to mention the fact that we give a very generous percentage of every run to the artist for free, so the costs of those copies have to be absorbed by the sale price of our copies. Believe me, we are not getting rich. We will be lucky if we break even.